The Zambian agricultural industry was left in no doubt of KSB’s commitment following the successful Agritech Expo Zambia 2017, in which KSB featured prominently with an array of innovative solutions presented by a high-level technical team from throughout southern Africa. 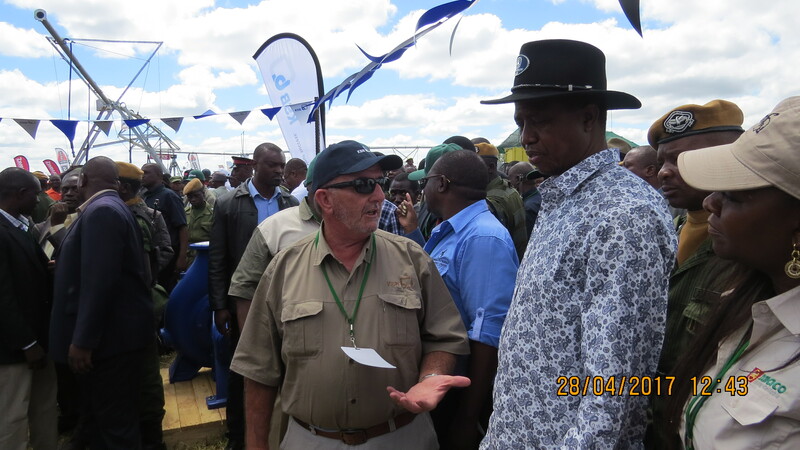 The prominent KSB stand also attracted the attention of Zambian President, Edgar Lungu, who visited the stand and confided his desire to take up farming after his retirement. He also assured KSB Zambia managing director, Alf Jacobsen, that when he did take up farming that he had earmarked KSB as a preferred supplier. In addition to the President, the stand proved to be a major drawcard for commercial and smaller scale farmers from across the region who specially visited the stand to discuss their own unique requirements. Existing and interested dealers were also keen to discuss the market’s requirements and expressed their eagerness to work hand-in-hand with KSB Zambia. Zambian President, Edgar Lungu, meet KSB Zambia’s Alf Jacobsen on the KSB stand. According to Alf, this was the first show of its type that KSB Zambia exhibited at and it met all the company’s objectives. “Our internal team of Fanus Terblans, Basil Hillier and Moses Shebele were able to share ideas with farmers and were delighted to see that many of the irrigation companies displayed KSB solutions as well. Locals were equally impressed by the high-level delegation manning the stand, which included KSB Pumps and Valves managing director, Sven Baumgarten, regional sales manager, Dave Jones, southern Africa sales manager, Andreas Gremels and country manager for Zambia and Botswana, Clinton Knott. This clearly displayed the level of support that they can expect in future. The show also gave the visiting KSB delegates the chance to reaffirm relationships with dealers and customers and allowed Sven to experience a show in the heart of Africa including some more rural areas. “We even got lost on the way back to the airport and as a result Sven got to drive on some lesser used roads that are not usually travelled by tourists and visitors. We also got to stay in some pretty rural accommodation with some of the team staying in small wooden chalets while others made themselves at home in tents,” says Dave.